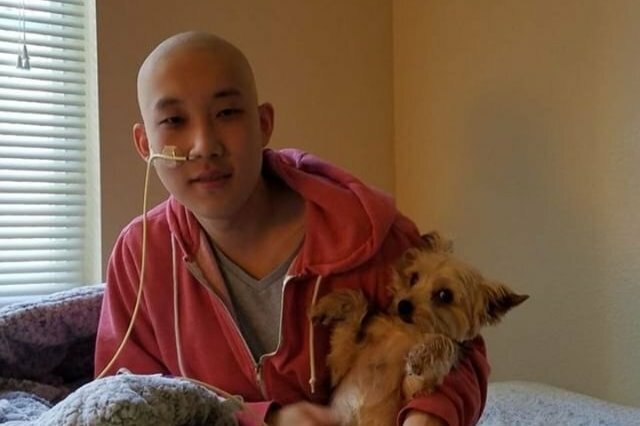 Since March, Brian has been fighting Osteosarcoma, a bone cancer that begins in the cells that form bones, and has not been able to attend school. He lives with his dad, sister, and dog, and unfortunately, his dad has not been able to work due to his time spent caring for Brian. After months of failure in chemotherapy, the only choice to stop the spread of his cancer came to be leg amputation on June 13th, and his recovery will not end until late November. He has been very brave and inspirational despite his adversity, but your support can definitely help him stay strong. Brian's family needs all the help they can get. Even a little bit of your contribution will help with his medical treatment and daily living expenses. Hey everyone! Most of the donations have been withdrawn and safely delivered to Brian Park last Sunday. Seeing all the support left his family speechless and were truly grateful for everyone's help! Thank you guys! I wanted to give a quick update on how Brian is doing! I had the chance to visit him this past Sunday, and I learned a couple of things. The first thing I learned is that Brian has had a much rougher road with treatment than I expected. I don't think it's right for me to tell his entire story for him, but I can say that there have been multiple instances where he has needed uncommon, traumatic, and painful emergency surgeries. The second thing I learned is that Brian is a fighter. This visit was the first time I've personally seen Brian in months, but it felt like no time passed at all. Even though he's been through the unimaginable, Brian has stayed optimistic, well humored, and powerful. His nurses predicted he would need three days of rest after his amputation before he could walk. Brian walked on the second day after his amputation. He told me that the wave of support he's been getting was helping him heal faster. I didn't understand what he meant by that at first, but then I saw him walk. I saw him fight and overcome his struggles getting up and going from place to place despite how difficult it is for him, and it became clear to me that Brian knows what he's fighting for. You all helped him find that. You've made a difference. From the bottom of my heart, I wanted to thank you all. The support you have given has been one of the most heartwarming things I have ever seen in this community, and you've transformed Brian's inspirational fight into something far greater than I'd ever thought was possible. I hope we can continue to spread the word and make this into something bigger! Brian's procedure went well, and he is doing well! Brian is hugely thankful for all the support so far, and he loves you all. Now, onto a speedy recovery!